Ever since they were awarded scholarships, the Able Flight “Class of 2017” had been waiting for training to begin. Months of anticipation culminated in the arrival of Brice Lott and Chris Corsi at The Ohio State University on May 15th, and a week later, Melissa Allensworth, Benedict Jones, Kunho Kim, Zackary Kurkalo, Ferris Butler, and Kathryn Brenner arrived at Purdue. After meeting their instructors and getting settled in their dorm rooms, daily flight and ground school lessons were quickly underway. Even with less than desirable weather throughout the Midwest in the first two weeks, instructors had the students up flying as often as twice a day, and time spent not in the air was time spent in the classroom. 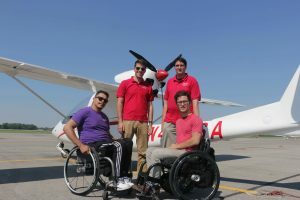 Instructing for Able Flight at OSU this year are Luke Shutway and Josh Fisher, with Joe Schwerdtfeger serving as supervising instructor, and Rob Mendez as student ambassador. At Purdue, Lucero Duran returns as lead instructor with Justin Beam, Allison Hoffman, Sean O’Brien, Chris Konecnik, Nick Liberman, Rob Banta and Molly Van Scoy as instructors. Wesley Major is the onsite program coordinator at Purdue for the fifth consecutive year. 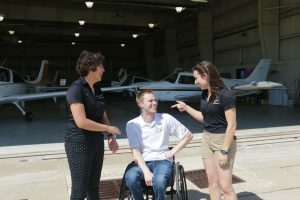 With the expansion of training to The Ohio State University, this is the largest group of students and instructors and support personnel in the history of Able Flight, and the logistical challenges reflect the size of the project.